As with any provider in CloudForms, we can easily extend functionality through integration with the provider's API, when the necessary functionality exists. Here is an example use case which came up recently. To scale an existing application, we need to replace-the-specified-deploymentconfig by changing the number of replicas. The token is the management service account token used by CloudForms and requires permission to scale the given application. Here is the full method. Calling the automation can be done in a number of ways, for example using a button, service or CloudForms API. Right now, buttons aren't available for OpenShift resources in CloudForms but they will be soon. In the meantime, we can use a service. We can variablise project, deploymentconfig and replicas and expose them through a dialogue. The project (namespace) and deploymentconfig (application) can be queried from the OpenShift API and added to a dynamic drop down element. Here are the methods. 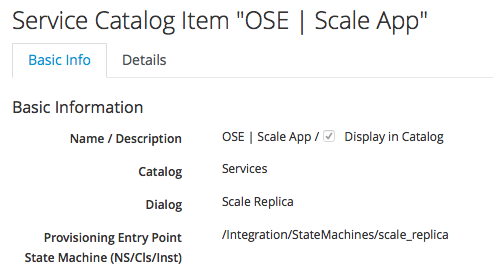 Create a catalogue item pointing to the statemachine. Our service is ready to order and we can scale up or down easily. 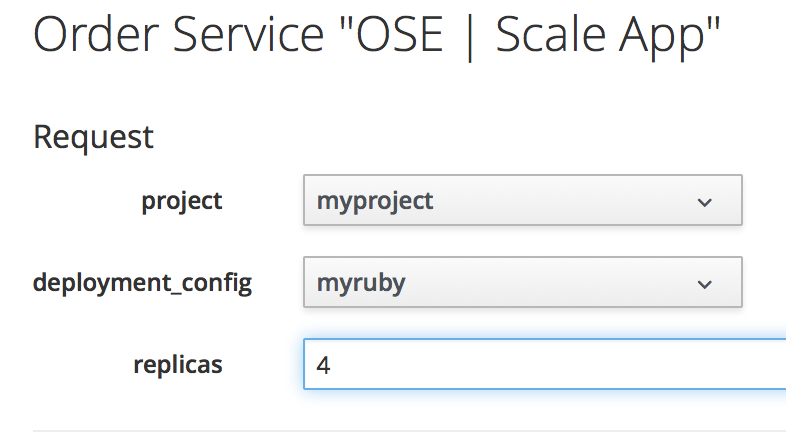 And in the OpenShift Console, we can see our scaled application.